Ventura River Ecosystem: fish stranding? It's that time of year again. Juvenile steelhead trying to make their way downstream become hindered by low flows in the river, and get trapped in pools that will inevitably dry up. This is an annual occurance in the Ventura River. Last year a dozen fish died at the Robles Diversion Dam. And the Ojai Valley Land Conservancy has documented fish kills at the pools downstream. This year biologists counted over 130 fish in the pooled area immediately above the Robles Diversion. Each year we report these situations, and government agencies stall on taking any action until it's too late. Since these are endangered species, a special permit is required to handle them. This year, for the first time, NMFS and CDFG are developing a steelhead rescue plan. These fish, which were attempting to migrate downstream, should ideally be transported downstream of the dry reach of the river so that they can make their way to the estuary where they can adapt to the salt water environment. It seems, however, that these agencies are planning to move them UPSTREAM, where cool year-round water is guaranteed - but which would limit the opportunity for these fish to migrate to the ocean. ...a large number (c. 50) of O. mykiss schooled up immediately above the Robles Diversion. I was a little doubtful about the number so I went out to the site to confirm the observation. While it was difficult to count the individual fish (because there were so many), there were actually two schools of fish, one immediately above and one immediately below the diversion, and probably number over a 100 fish. They were all of uniform size (c. 6-7 inches) and were milling about in the two pools (2-10 feet deep). The District fishery personnel indicated that they began gathering upstream of the diversion about a month ago, though only one fish (so far) has been found in the smolt trap located upstream of the fair-weather crossing approximately 100 yards downstream of the Robles Diversion. Given their near uniform size, coloration, and behavior, these fish appeared to be smolts preparing to emigrate out of the system. (These fish are possibly progeny from the adults that were observed passing upstream through the Robles Diversion fish passage facilities last year.) The flow upstream and through the Robles Diversion fish passage facilities was approximately 10 cfs. 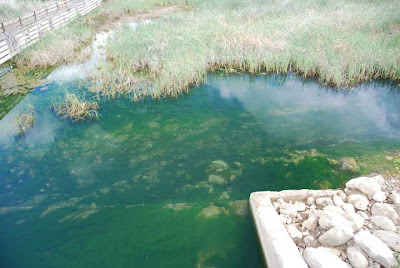 The water temperature was in the mid-50s, but algae had begin to develop on the cobble bottom up and downstream stream of the Robles Diversion. The surface flow extends downstream for only a 3/4 of a mile, then goes underground for another 6 miles, before resurfacing a 1/2 mile above the confluence of San Antonio Creek. 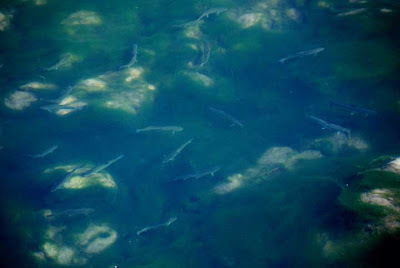 There is continuous flow from Casitas Springs to the ocean, and the mouth was open, but the dry reach would make it impossible for these fish to emigrate, should they begin to move downstream from their present location.